This post was inspired by Lori Kaufman's post on How To Geek about adding symbols. She writes a regular column on how to do useful things with common applications, and it's very much worth following. It might seem odd to label a post about diacritics and ALT codes under "The Basics" when most people don't even know what the word "diacritic" means, nor have they used ALT codes. But you've seen diacritics, and quite possibly used them, even if you don't know what they are, so you definitely need to know how to add them when you're writing. And the easiest way to add them is with ALT codes. So, what is a diacritic? A diacritic is a symbol or glyph added to a letter, primarily to show how that letter is to be pronounced in the context of the word. If you ever studied French at school you'll be familiar with accents such as ´ (acute) or ` (grave); accents are a type of diacritical mark. For those of you with a more Germanic bent you'll be familiar with the ¨ (umlaut), but even if you've never spoken a language other than English you should still be familiar with the diacritics in façade and naïve (called a cedilla and diaereses respectively). A good example of how a diacritic changes the pronunciation of the word is "rèsumè" (also known as a CV), where only the accents distinguish it from "resume" (to begin again after a pause). There is plenty of material available on the use of diacritics if you want to delve into it a bit more (and please do, they're fascinating), but what we're concerned with here is how to add these marks when using standard technical communication tools. 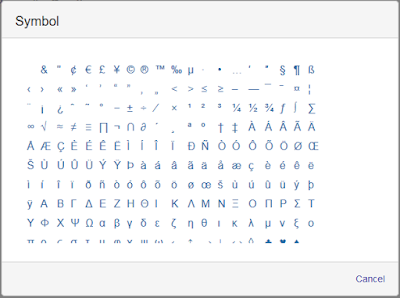 Each of these tools provides built-in fonts and/or glyphs that cover diacritics, as will any decent word processing or content authoring tool. Wikis are often a bit different because they have more or less of a GUI or WYSIWYG interface. As a general rule, the less GUI, the less built-in support you'll get. Confluence does have built-in diacritics, but once we've covered the 3 tool examples we'll look at a more general method for typing diacritics. By default, this dialogue will open with a Font value of (normal text) and a Subset value of Basic Latin. 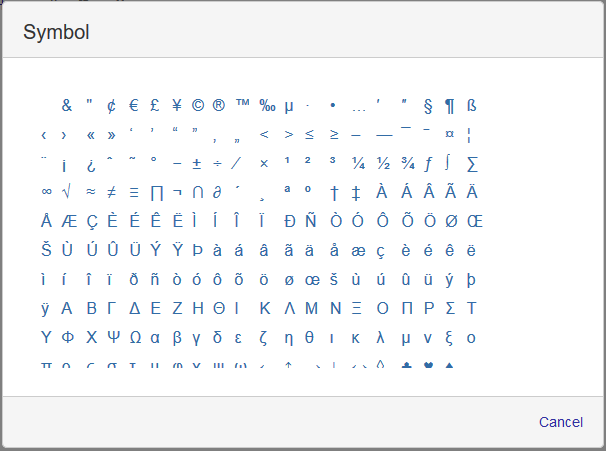 This will display the familiar Latin alphabet and if you scroll down you'll find lots of diacritically marked letters, grouped into language families. For example, the French diacritics are together, the Slavic ones are together, and so on. Select the Font you want, if it's different from the font you're currently using, and scroll down the list. You will almost certainly find the letter and diacritic combination you want, whether it's the familiar Latin-derived alphabet, Cyrillic, or Greek. If you want to know the official name of a symbol, click the character and the Unicode name will be displayed under the Recently used symbols box. In the screenshot above, I've selected "Latin Small Letter A With Tilde". (For those of you who did a little German at school, a diaeresis is identical in formation to an umlaut, although they alter the word in slightly different ways). 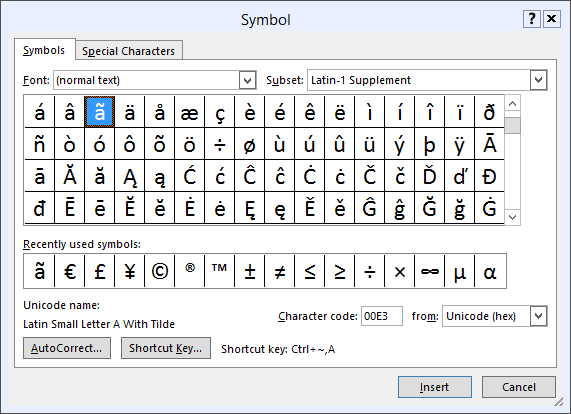 FrameMaker allows you to enter these supported diacritics by using an Escape key sequence. For example, to type an è (an e with a grave accent) you press the Escape key, then the ` (left quote) key, then the e key. Unlike CTRL+ALT+DEL where all of the keys need to be pressed at the same time (i.e. in combination), in FrameMaker you need to press them one after the other (i.e. in sequence). 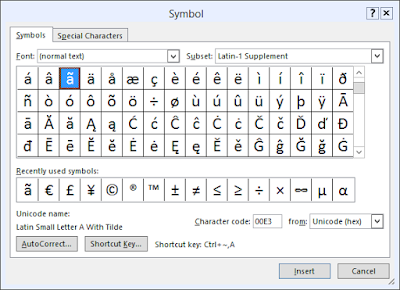 You can find the list of FrameMaker-supported diacritics and other symbols here. These are good examples of the type of functionality you'll find around diacritics in modern tech comm tools. They range from the comprehensive to the minimal, but they're still better than some applications that provide no functionality at all. What's the generic way of entering diacritics? Different applications have different methods for entering diacritics, and different native support, which means more learning and a patchy experience. So for those of you looking for a generic way that will work in any application, you need ALT codes. ALT codes are a method of writing special characters that aren't represented on the keyboard. Pressing the ALT key (or Option on a Mac) and a number on the numeric keypad will display the special character. For example, ALT+138 will type è, an e with a grave accent. You can find a complete list of the basic ALT codes here. Note that you need to use the numeric keypad - the square of numbers on the right hand side of a standard keyboard - to type these in. However, there is a little more to it than that, because some ALT codes do the same thing. If you type ALT+0232 you'll get the same è that you do with ALT+138, which seems...odd. What's going on? 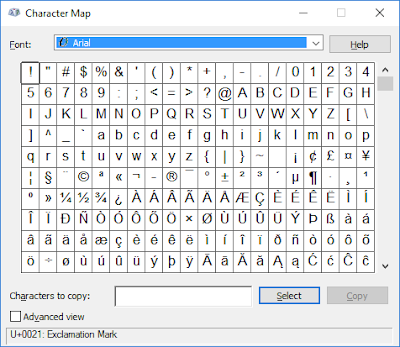 But 256 characters is quite limited, and other architectures slowly emerged as well, so Microsoft decided to use their own, additional character set, which is known technically as Window's ANSI/ISO Latin-1/ANSI Extended ASCII. This provided additional space for more codes by prefixing them with a 0, and in this Windows-encoded character set ALT+0232 will produce è. You can download an ALT code cheat sheet in PDF format here (Warning: link goes straight to the PDF) that includes both the OEM- and Windows-encoded ALT codes, grouped together in useful sections rather than a numeric list. 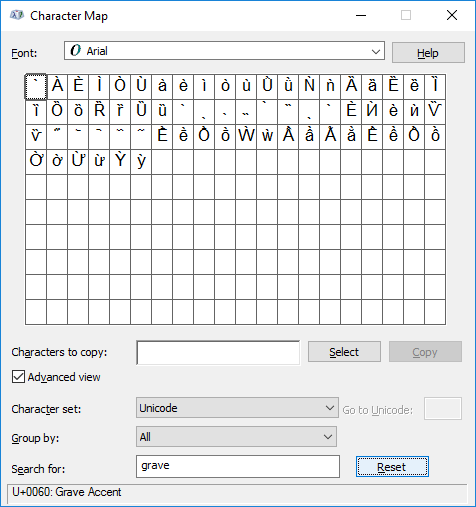 In modern incarnations of Windows the Unicode 16-bit character set is used, as it's the global standard, but the original OEM- and Windows-encoded character sets are still there and the ALT codes for those still work. 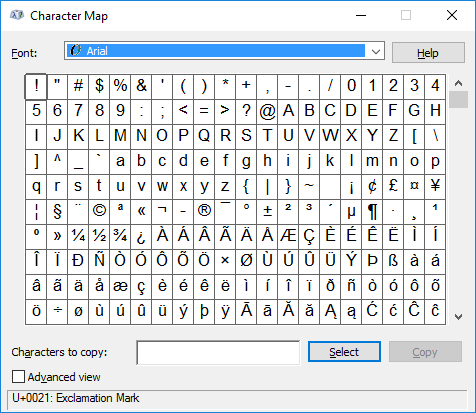 As you can see in the bottom left, the Unicode value is shown for the selected character. To use this as an ALT code just use ALT+[the four digits], in this case 0021. The Character Map is probably the single easiest way to search for and find the ALT code you need, and will allow you to handle any diacritics with ease. A History of Code Pages or What Made Code Page XXXX The Way It Is? If you know of other good resources about character sets and encoding for the educated non-developer, put them in the comments.